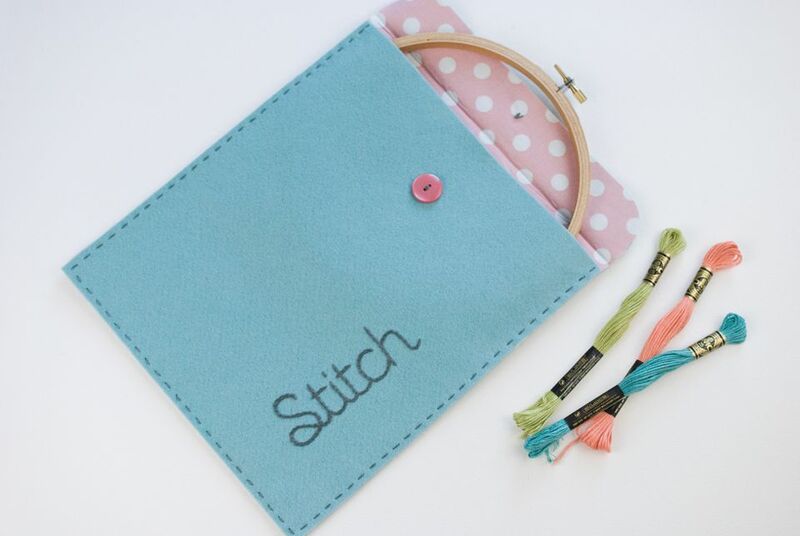 Do you take your stitching with you when you're on the go? It's easy to toss your supplies in a plastic bag, but an embroidery project pouch protects your work while looking pretty! This easy project can be entirely stitched by hand, so you barely need any sewing experience. The result is a handy way to carry your embroidery with you. Because we should always be ready to pick up our needle when there are a few minutes to spare! Your finished pouch will comfortably hold a 7-inch embroidery hoop, but you can adjust the size to suit your needs. Wool or wool-blend felt will keep your pouch looking nice for a longer time, but acrylic will work. Also, you may notice some fraying on the fabric over time. That's to be expected, but it will be minimal with care. Adding an embroidered element to your pouch is optional, but it's a great way to customize the bag. Choose your favorite embroidery motif or add the word "stitch" as shown above. The pattern is available as a downloadable JPG and should be printed so that it measures about 4 inches across. Mark the pattern on the lower right corner of one piece of felt. We recommend the tracing paper method. You can also use water-soluble stabilizer, but your felt may shrink slightly. Embroider the design. Three strands and reverse chain stitch were used on the one above. Remove the transfer material (tracing paper, stabilizer, etc.) and press the felt from the back. Use a setting on your iron that is suitable to the felt you are using. Cut a 2-inch strip off of the top of the embroidered piece of felt so that it now measures 9in x 10in. Cut a 9in x 12in piece and a 9in x 10in piece of quilting cotton. Cut a 9in x 12in piece and a 9in x 10in piece of fusible interfacing. Match up the fabric and felt that are the same size pieces. With wrong sides of the fabric and felt facing each other and with the fusible interfacing between them, iron the pieces to fuse the layers. If you are using paper-backed interfacing, as shown above, iron it to the felt first, then remove the paper backing and iron the fabric on next. Round the corners of the larger piece, which will be the back. A very small cup or dish (with about a 2-inch diameter) makes an excellent template. Or you can leave the corners as-is. The closure on this pouch is similar to old envelopes used for inter-office mail. You can replace this system if you prefer snaps, magnets, etc. Place the embroidered front piece on top of the back piece, with the bottom edge aligned. Fold the flap of the back piece down and iron it to crease the flap. Sew a button on the center of the flap. Sew a button on the center of the embroidered front, just below where the flap overlaps. Cut a 16-inch piece of embroidery floss. Tie it around the button on the flap with a doubled knot. Tie the two ends together and trim them to be even. Pin or clip the front and back pieces together on the three sides. Stitch along the edge, about 1/4in from the edge, using three strands of embroidery floss and running stitch. Begin and end with a knot so that your sewing is secure, but take care to hide the knot between the layers. If you would rather, you can sew the three sides on a sewing machine for a faster finish. When the sewing is done, your pouch is ready for use! Slide your embroidery work, hoop, and a few supplies inside. Fold the flap closed and use the string to wrap a figure 8 around the two buttons a few times. This will secure the flap. If you are only placing your work in the bag for a short while, you can leave it in the hoop. Otherwise, it's a good idea to remove the fabric from the hoop between stitching sessions. When adding extra supplies in your project pouch, you may want to keep them in a smaller bag so they are easy to grab. And be sure to keep your needles safely tucked away! You can make several of these cases for your work-in-progress projects or even make them as gifts for all your stitching friends!